Princeton, NJ – Dartmouth brought three teams to the Ivy Sevens Championships this weekend and left with all three sides in a celebratory mood. The first and second teams both competed in the top tier of the tournament and both reached the finals, with the 1st VII beating Columbia, Harvard, Princeton and Yale without relinquishing any scores on the day. The second squad had a tougher go as they competed against the 1st VII squads from the other Ivies but showed inner strength and fortitude in coming back from a 38-0 defeat at the hands of Brown in their second match to beat Yale 33-10 and Columbia 28-14 to reach the finals, while Brown lost two qualifying matches which knocked them out of the competition. Rather than playing against each other in a final game and risking injury, the boys received their hardware and celebrated together. Meanwhile, the third squad playing in the B division went undefeated and took home a championship trophy as well. Major contributions to the first side also came from captain Madison Hughes ’15, who had his usual standout performance including four tries and several conversions, and John Abraham ’16, a track sprinter converted into sevens player with a few nifty tries of his own. For the 2nd VII, which started the day beating Cornell 35-0 before losing to Brown and then defeating Yale and Columbia, Brendan Cronin ’15 and Max Parker ’17 stood out with impressive finishing speed. They each dotted down multiple times in the try zone following long runs. Meanwhile, Will de Chatellus ’16 won Man of the Tournament in the B division for his stellar play for Dartmouth’s 3rd side. 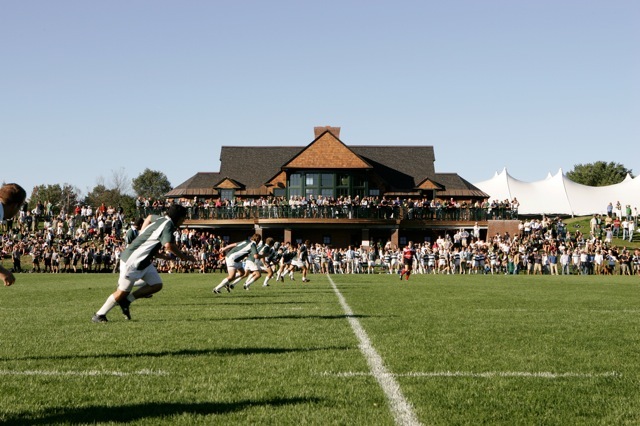 By winning the tournament, Dartmouth qualifies for the National Collegiate Sevens Tournament to be held in Greensboro, NC on November 23 and 24. In the mean time, the players return to Hanover for two weeks of training in preparation for the great opportunity.